The rules for assignment of priorities in order to assign absolute configuration are based on the same set of rules which have been used previously for assigning E and Z stereochemistry. The procedure is fairly straightforward for simple compounds; first, you assign priorities to the groups attached around the chiral center. Next, you rotate the molecule so that the lowest priority group is pointing towards the back (away from you). Finally, you examine the remaining group priorities and determine if they are now arranged so that the priority decreases clockwise (R, for rectus) or counterclockwise (S, for sinister). Sequence priorities to the four substituents are assigned by  looking at the atoms attached directly to the chiral center. The immediate substituent atom with higher mass number  gets  higher priority. Different isotopes of the same element are assigned a priority according to their mass number. If two substituents have the same immediate substituent atom,  then the atoms are evaluated evaluate  progressively further away from the chiral center until a difference is found. i.e. If a decision regarding priority cannot be reached using Rule #1, compare the atomic numbers of the second atoms in each substituent, then the third, etc., until a difference is found. Double or triple bonded substituents , are treated as an equivalent set of single-bonded atoms. Once the priorities have been assigned, rotate the molecule in space so that the lowest priority group is pointing back. Connect the three remaining groups in order of decreasing priority and examine the direction of the resulting rotation. Rotation which is clockwise is termed R (rectus; right) and rotation which is counterclockwise is termed S (sinister; left). While discussing optical isomerism, we must distinguish between relative and absolute configuration (arrangement of atoms or groups) about the asymmetric carbon atom. Let us consider a pair of enantiomers, say (+)- and (–)- lactic acid. We know that they differ from one another in the direction in which they rotate the plane of polarised light. In other words, we know their relative configuration in the sense that one is of opposite configuration to the other. But we have no knowledge of the absolute configuration of the either isomer. That is, we cannot tell as to which of the two possible configuration corresponds to (+)  - acid and which to the (–)  - acid. Obviously there appears to be no relation between configuration and sign of rotation. 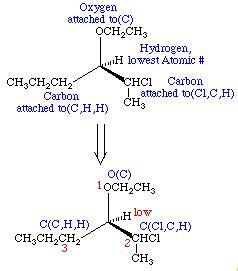 Thus D-L-system has been used to specify the configuration at the asymmetric carbon atom. In this system, the configuration of an enantiomer is related to a standard, glyceraldehyde. 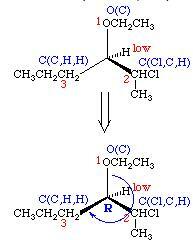 The two forms of glyceraldehyde were arbitrarily assigned the absolute configurations as shown below. When there are several asymmetric carbon atoms in a molecule, the configuration at one centre is usually related directly or indirectly to glyceraldehyde, and the configurations at the natural (+)-glucose there are four asymmetric centres (marked by asterisk). By convention for sugars, the configuration of the highest numbered asymmetric carbon is referred to glyceraldehyde to determine the overall configuration of the molecule. For glucose, this atom is C–5 and, therefore, OH on it is to the right. Hence the naturally occurring glucose belongs to the D-series and is named as D-glucose. However, the above system of nomenclature based on Fischer projection formulae, has certain disadvantages. Firstly before a name can be assigned to a compound, we must specify how its projection formula is oriented.